This "Historically Speaking" column appeared in the Exeter News-Letter on January 27, 2017. On a cold, foggy January night in 1930, residents in the western part of Exeter were jarred awake by a thunderous crash. Two freight trains, one headed for Ayer, Massachusetts, and the other for Worcester, had collided on the tracks near the Powder Mill road crossing. The archives at the Exeter Historical Society do not have any photos of the wreck, but there are two accounts of the accident. The other January rail accident Eugley recalled happened in 1966, so there are probably many current residents who remember it. The weather had been brutally cold. At about 5:45pm on Tuesday, January 11th, when most people were sitting down to dinner, “the crash sounded like the sonic boom of a jet aircraft, and the subsequent screeching of metal indicated that it was not an aircraft.” The Exeter News-Letter reported that, “A broken wheel was given as the cause of a spectacular freight train wreck, shortly before 6 pm Tuesday, which demolished the Railway Express Agency building in a 17-car pileup.” Like the wreck in 1930, the damage was extensive but no injuries were reported, although “Joseph Mantegani, the Railway Express agent, escaped certain death when he left the building but a few minutes before the long train came speeding down the eastbound track at 50 miles an hour.” Mantegani had decided to leave the office a bit early to visit his wife in the hospital. The decision likely saved his life. 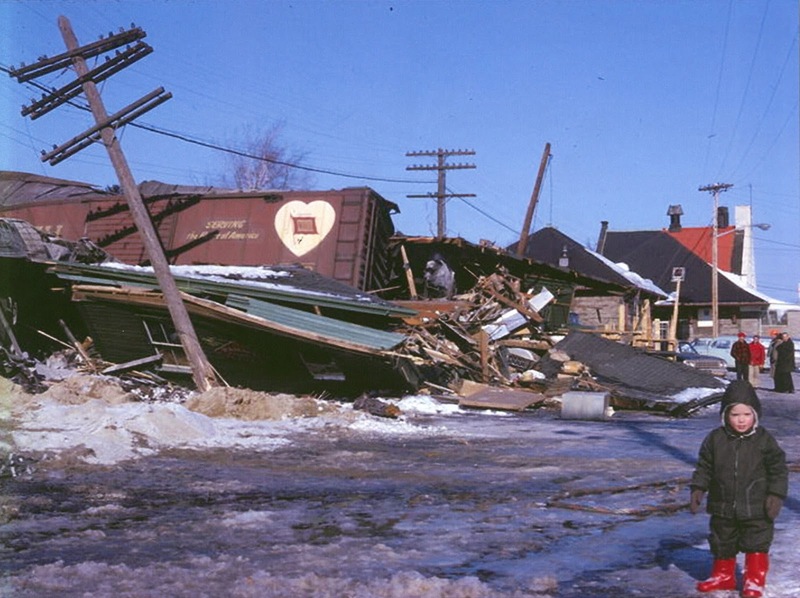 Image: Young Sargent Kennedy poses next to the remains of the Railroad Express office at the Lincoln Street depot the morning after a derailment. (Photo courtesy of Frank Kennedy).